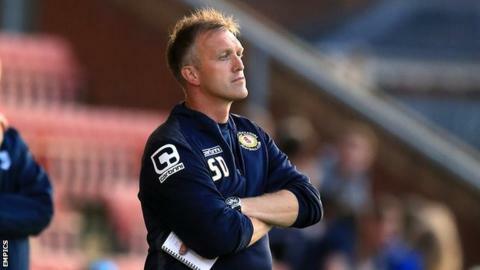 Crewe Alexandra manager Steve Davis says there will be no more loan additions to his squad despite them propping up the table in League One. The Alex have picked up just two points from their first seven league matches - but they are notoriously bad starters. "We're not to going to add to it now," Davis told BBC Radio Stoke. "We can't at the moment. We'd have to get somebody out to bring somebody in. We have to look at the financial implications." Davis added: "We've got to work with the lads that we've got. I've got great faith and trust in them. If they know that, they're going to give their best. That's the sort of healthy relationship you need in any club." Where did they end up? Crewe have so far struggled for goals this season, averaging just one a game. But, ahead of this Saturday's local derby at Shrewsbury, Davis is insistent that they have the players to turn it round. "We're all looking for that special player, that can you get you those goals," added Davis. "But there's goals in the team. We're creating a lot of chances. "We may already have that player in our ranks, who can emerge. Hopefully someone who will come through who can score the goals that will help us start climbing the league."